Expert Repair and Custom Design. We offer a full range of jewelry repair services including (but not limited to) ring sizing, restringing, diamond/gem setting and soldering. 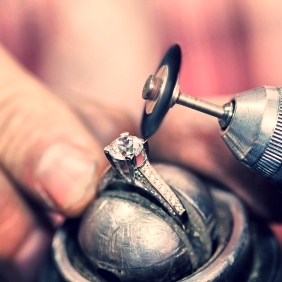 We offer free estimates on jewelry repairs and the turnaround time for most repairs is 24-48 hours. We also offer free professional cleaning and inspection services. Prongs can wear and clasps can break so make sure you have your fine jewelry checked periodically to prevent loss or damage. All our Rolex watch repairs are serviced right here in Southern California. We have a 20-plus year working relationship with our Certified Master Watchmaker and stand by our two-year warranty on service, providing you with the best Rolex repair services found in Long Beach! We service and repair most types of watches including pocket watches and contemporary and vintage timepieces. We also service and repair fine watches like Patek Phillipe, Cartier, Concord, Breitling, & Panerai. Our skilled watchmaker has been with us for over 15 years and has over 35 years of experience. We also offer replacement of watch batteries and watchband adjustments, usually with same day service. Waterproofing and pressure testing is also available. We offer free estimates on all service and repairs. We specialize in custom jewelry design and can help you create a beautiful, personalized piece. Our staff gemologist will guide you through the process of choosing the right materials to fit your budget and your imagination. Gold is at an all time high and NOW is the time to clean out your jewelry box and get cash for the gold you aren’t wearing. We offer some of the most competitive rates among jewelry stores in Long Beach, CA, and can put cash in your pocket today! We are more than happy to consult with you via video chat or in person. Schedule an appointment now.